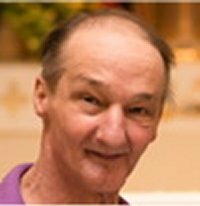 Clayton E Crockett, 58, of Belleville, Illinois, born Sunday, September 25, 1960, in Belleville, IL, died Monday, January 21, 2019 at his residence. Clayton worked as a Combat Engineer for U.S. Army serving during Desert Storm. After his retirement from the Army he was a contract employee for AT & T.
He was a avid St. Louis Blues fan, fisherman and outdoorsman. He was coach for youth hockey with the Fairview Heights Hawks. Visitation: Visitation from 2:00 pm – 6:00 pm Sunday, January 27, 2019 at Kurrus Funeral Home in Belleville, Illinois. Funeral: A funeral procession will leave from Kurrus Funeral Home in Belleville, IL at 9:15 am, Monday, January 28, 2019 for a 9:30 am Mass of Christian Burial at St. Augustine of Canterbury-Belleville with Msgr. Bill McGhee officiating. Interment with Honors will follow at Jefferson Barracks National Cemetery, St. Louis, Missouri. I knew Clay. He was also a good friend of my brother Chris. Prayers to your family! RIP Clay! To my brother in arms. Essayons Combat Enginners for life. Clay the memories I have of us over in Germany. Good times! I will always picture him as DJ at the Johnson Barracks Club in Germany. Such a nice man. Prayers to your family. Kathleen, I’m so sorry for your pain of the loss of your husband. From what I heard about Clay, he was a wonderful person and family man. We know this by seeing your beautiful children…. I love and respect as a Brother and Solider. With so many memories in Germany. I never really listen to Rock and Roll, till I heard you D.J. I Love you and You will never be Forgotten, in Spirit and Heart. Sincerest condolences to the Crockett family. I had the privilege of playing hockey with Clayton. He was such a nice man and fun to be around. He will be missed. Rest in Peace. I grew up with Clay in the neighborhood. Loved watching him skate on the duck pond. He had fantastic hockey skills and we battled many an hour on that frozen arena! Condolences to his family and friends. Rest easy! My prayers go out to Kathy and her whole family. May God give you strength and guidance during your time of grieving. God Bless!